Republica Timai River at Buddhashanti village in Jhapa district. JHAPA, March 16: The locals of Buddhashanti village had never imagined that their lush green fields would one day turn into barren land. The canal which used to be filled with water has now become home for ants. Water used to flow continuously from taps in the past but now locals have to wait for days to get water. The lively vegetable farms and fruit orchards have now turned into deserts just within a span of two years. This has compelled the local farmers to visit the market to buy vegetables. This year the production of betel nuts was not even half of what it used to be in the past as the betel trees are also dying due to the dry spell. This is the present condition of Buddhashanti village which lies 8 km north of Dhulabari in the East-West Highway. One can clearly see the devastating effects of unabated excavation in Chure. The sources of irrigation and drinking water have dried up in this area. 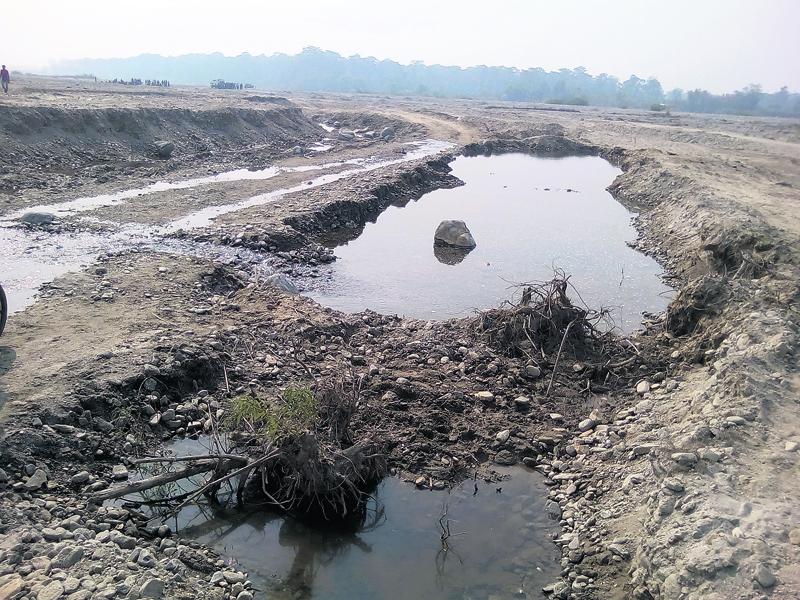 Hundreds of locals have been bearing the brunt of dry spell due to the vested interest and negligence of some contractors working in Timai River which flows through Shantinagar. Since the last two years, the villagers have had to wait for monsoon to irrigate their fields, according to Bhattarai. Few years ago, Buddhashanti (earlier known as Shantinagar) of Jhapa was renowned for vegetables and cash crops. But the last two years have been futile for the local farmers as all three sources of water have dried up. According to locals, more than 600 bigha of arable land depend on rain water for harvesting. “Every year, the river gets deeper and if it continues we will soon be displaced. We cannot channel the water to our farms,” said Basudev Rai, a local residing near the river. Villagers express their dissatisfaction toward the Village Development Committee for taking no action against the contractors. As the responsible authorities have turned a blind eye to the issue, villagers themselves have formed a committee to check haphazard extraction. They have also been knocking the doors of the government for help. According to the villagers, they are not completely against the extraction but all they want is to carry out the work under limitation suggested by experts. “We are not against extraction. But how can we tolerate extraction at such a scale that it destroys our source of water?” questioned Bhuminandan Bhandari, a local. “Maybe, they will build bridges and buildings elsewhere with these materials but what about us? Shall we shift to the river banks?” he asked. They accuse the government offices and Armed Police Force for giving little attention to this issue. Villagers lament that they have been receiving false promises from the government authorities. The story of Biring Khola is no different as many locals have almost become displaced due to the negligence of contractors. Locals residing nearby the river expressed disappointment toward the authorities for ignoring their problems despite their repeated visit.